Corporate actions are events that affect large corporations through to the individual investor - even those that own a single-share! All organizations that hold equity and debt securities for themselves and/or on behalf of others are affected when the issuer of a security announces an income or corporate action event. The successful management of the array of different event types requires understanding of the inherent risks, and tight controls at critical points in the event lifecycle. The management of income and corporate action events are important and essential parts of the securities industry business. 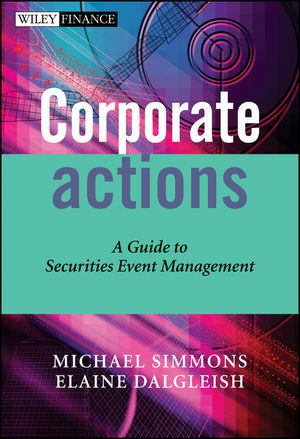 Written by authors with many years experience within this sector, Corporate Actions: A Guide to Securities Event Management sets out to demystify the subject and provides a thorough, step-by-step introduction to corporate actions and income events. Corporate Actions is essential reading for all those involved in the securities industry, from new recruits to those involved in both the day-to-day operations process and those within executive management. It will also prove invaluable to those providing consultancy and software solutions to the securities industry. Corporate Actions is the first major work on this subject. Many people within the securities industry have heard of corporate actions - many people know they can be highly risky - many organizations have lost vast sums of cash in attempting to process them - very few understand them! MICHAEL SIMMONS has spent the majority of his working life within the operational areas of international investment banks, most notably within the S.G. Warburg group in London. Having gained a detailed understanding of various back office tasks through many years of hands-on experience, he assumed managerial responsibility for a number of operational areas. In recent years, Michael has worked as head of business consultancy within a global computing services firm, and is now an independent analyst and trainer. Michael’s areas of expertise include all aspects of the fixed income and equity trade lifecycle and related activities, including operational risks and controls. Recent assignments include the offshoring of operational activities to India and operational risk analysis (the Sarbanes Oxley act). In addition, he creates and delivers training courses on the workings of the securities industry and associated operational aspects to audiences around the world. Michael is author of Securities Operations: A Guide to Trade and Position Management published by John Wiley & Sons, which describes the fundamental components of operational activities from a first-principles perspective. ELAINE DALGLEISH has spent her working life within the operational areas of investment banking and stock broking, working directly for international banking firms and financial software providers. Elaine’s hands-on experience spans various middle and back office operational disciplines in multiple markets. Whilst working directly in investment banking and stock broking, this has ultimately included the managerial responsibility for a number of operational areas. The focal point of Elaine’s working history is the consistent involvement with Corporate Actions operations, initially with the manual processing of events as a custodian, and subsequently working as a Senior Business Analyst, specialising in Corporate Actions, analysing client requirements, and consulting in process re-engineering for Tier 1 and 2 investment banks. As a consequence, Elaine has both observed and been directly involved in the evolution of global market practices of Corporate Actions operations and the move to automation.